Our goal at Piano Lab is to provide our students a fun and motivating environment that cultivates lifelong musicianship. We cannot do that without building strong relationships with our families. This form was designed to address many of the logistics necessary to ensure that our students are well served and that our parents are well informed. Thank you for taking the time to review it carefully and for your participation at Piano Lab! Whoops! Looks like there was an error with your email; Is it possible we have another email for you? If not, it might be an issue on our end. Please email Frazier@StudentsLovePianoLab.com and we'll get it resolved quickly! I understand that Piano Lab is a year-round program with weekly classes during the school year and week-long camps during the summer. As an enrolled Family, we are committed to build a long-term relationship with Piano Lab to allow our students to achieve music literacy. Should our needs change, we will provide Piano Lab a full 30 days notice of cancellation. Upon cancellation, we understand that Piano Lab will no longer hold the student's space and that there is a $150.00 fee for re-registering. 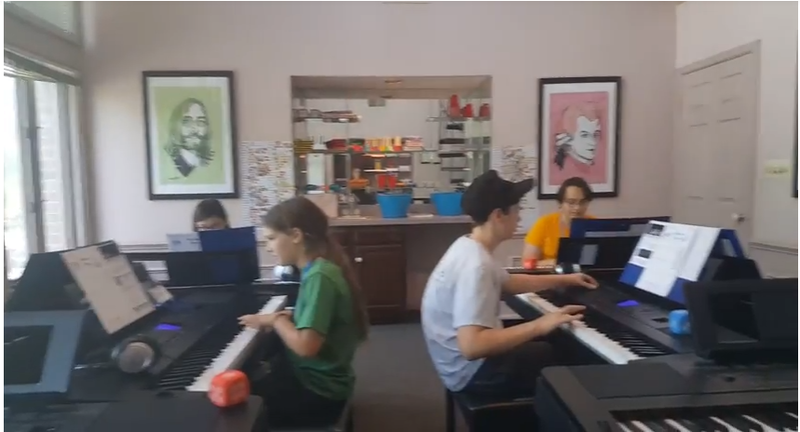 As a courtesy, Piano Lab will now offer credits towards extracurricular opportunities for students who are unable to attend camps over the summer (or another extended period) but who want to hold onto their spot and avoid the re-registration fee. (Pausing subscriptions will no longer be an option). *These will be announced throughout the year. Please note that these activities are a bonus and are not intended to be of equal value to lessons missed. Summer Camp options will be available for review by March 1st. Deadline for selecting summer weeks or requesting non-tuition credits will be April 1st. Piano Lab's Annual Recital is the First Saturday in June. I understand that our student is expected to participate and I will let Piano Lab know by April 1st if we have any scheduling conflicts on that day. Otherwise, my student may be scheduled to perform with their group any time that day and once scheduled, cannot be moved. I understand that Piano Lab regularly celebrates and shares glimpses of the classroom activities with parents as well as for promotional purposes. I give permission for Piano Lab to take and share photos and videos of my child. I understand that class time is valuable and will make every effort to arrive on time for both drop off and pick up. I also understand that Piano Lab shares its space with other businesses and I will avoid waiting or congregate in those common spaces. As a courtesy, I will also limit noise by dropping and picking up students at the front door unless other arrangements are made. As a family, we commit to practicing at home, getting to our lessons on time, and bringing our materials (book, pencil and any printed pages) to class. Practicing is imperative for the success and progress of each student. We understand that if our student is consistently unprepared, Piano Lab will reach out to discuss the issue and provide support. If the issue persists, however, we understand that Piano Lab reserves the right to transition our student out of the group program and will provide a referral for a private instructor. We will let Piano Lab know about planned absences (vacations, sports, other special events) as far in advance as possible. We understand that due to the nature of ensemble classes, make-ups are not available and that our tuition remains the same each month regardless of attendance. For late arrivals or last minute absences, we will text (703) 887-4133 so teachers can adapt class as needed. We understand that there are several teachers at Piano Lab who may share responsibility for for leading my student’s class. If for any reason a teacher is not available and our weekly class must be canceled, we will be given a credit to apply to one of Piano Lab’s non-tuition activities. We understand that the Piano Lab will close for 4 weeks during the school year. (Thanksgiving-1, Winter Break-2 and Spring Break-1) We will review the Piano Lab website, www.StudentsLovePianoLab.com for details. We understand that for inclement weather, Piano Lab will follow Fairfax county school closures and that no make-ups or refunds are provided for weather related closures. Piano Lab will not close for all teacher workdays but will close for federal holidays observed by FCPS. (Columbus Day, MLK Day, Presidents Day, Memorial Day) For this reason students scheduled on Mondays will be credited one month’s tuition annually due to the multiple cancellations. We commit to paying tuition on time, during the first week of the month. We understand that we will incur a $25 late payment fee per student if tuition is paid later than the 7th of the month. We understand that as a courtesy, Piano Lab purchases and provides lesson books for our student as needed. (Average 1-2 per year) We agree to pay book fees via paypal when requested by email. We understand that a recital fee of $25 per student will be due by February 1st. We agree to abide by all additional rules and procedures communicated or posted by Piano Lab LLC as related to our participation in activities and use of facility. June - First Saturday - Recital!